From Maggie’s I went directly to another event where there was also very little to photograph, but one that I had wanted to write about. UK Uncut had launched a series of protests across the country that had caught the public imagination, campaigning in particular against people and companies who were avoiding – mainly by legal subterfuges – paying their share of UK income tax. It was a campaign that was getting wide support, not least because most people get their tax deducted at source under PAYE and don’t have any choice in the matter. If you are wealthy – either as a private individual or a company – you have the option of employing accountants and tax advisers who will tell you how you can legally avoid paying UK tax, exploiting various loopholes and dodges. Companies that are actually based in the UK, trading here, getting their profits from UK taxpayers can apparently save billions entirely legally by pretending to be based overseas, setting up a largely notional office in some foreign country. Similar scams also help many of our richest private citizens to avoid large proportions of their tax bills. Most of us knew that these things happened, but UK Uncut has made us aware of the huge scale that the national economy is losing out because of them – as well as the identities of some of the major culprits, with its protests at Topshop, Boots, Vodaphone, major banks and elsewhere. Although the government occasionally condemns tax dodgers – and particularly those who do so illegally – successive governments have failed to take effective measures to prevent tax avoidance. The Conservative party in particular depends strongly on the contributions of those who gain most from lax tax laws, and protecting the interests of the wealthy – including many in the party – is at the heart of its policies. For them, UK Uncut are a problem, and doubtless one that the police have come under great pressure to do something about. But their actions have been generally well-ordered and non-violent, composed largely of well-educated middle class protesters. They have occupied premises for short periods, holding classes in them, and have then left when requested without causing damage. At Fortnum & Mason, UK Uncut were also well-behaved. Outside the shop a few yards away police were fighting other protesters as the largest and largely peaceful trade union demonstration in London filed past. The media were concentrating on the few hundred people involved in violence (and I’d left the UK Uncut protesters to go home shortly before they arrived at Fortnum & Mason, as I had been hit earlier by a paintball, and it was beginning to get rather uncomfortable as the paint was drying out), and I think the politicians and police saw their chance to act firmly against UK Uncut and carry out a mass arrest, linking them in the public mind with the rather mindless violence on the streets. So the police lied to those in Fortnum & Mason, asking them to wait until things had quietened down outside, when they would be allowed to leave. Police praised them for their co-operation, but actually they wanted to hold them there until it was safe to bring up police vans to arrest them and take them away. Many were then held for almost 24 hours in police stations, sometimes being refused their legal rights to make contact. Some were released in the middle of the night, miles from their homes and not knowing where they were, some dressed only in their underwear covered by near-transparent white suits. ‘Would you send your daughter home Like this?’ As police did. Eventually charges against most of them were dropped. Around 30 were picked out and charged with the serious offence of ‘aggravated trespass’, apparently because there was evidence (such as the possession of leaflets) that they wanted to ‘promote their cause’. It’s unfortunate that the judge who pointed out that this was completely legal failed to take the obvious further step of throwing out these cases, though they seem almost certain to fail at a later stage. What won’t happen – and why there won’t be justice in this matter – is any proper enquiry into the political pressures put on the police or disciplinary procedures against those officers who bowed to them, who lied to protesters and who were responsible for detaining the protesters and their lack of proper treatment. By arresting so many, and by keeping up the long-winded process of bringing some of UK Uncut’s key movers to trial, the government’s attack on organised peaceful protest in this way has been extremely effective. But in the longer term it may have the effect of radicalising a larger and wider swathe of the public. It was hard to know what there was to photograph outside the Magistrates Court, and I think many of those protesting there did not know what they should do. Some went into the public gallery though they had remove their white track suits to be admitted. There were few placards or banners, little chanting, just people concerned about what was happening to peaceful protesters and who knew that our legal rights to protest needed defending and were prepared to come and stand up for them. 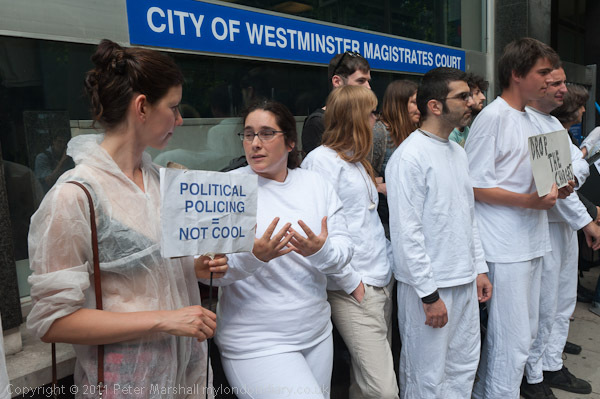 I didn’t want to organise or pose people but I did try and get them in front of the sign with the name of the court, and to make use of both the white suits they were wearing and the few placards. There are more pictures (and text) on My London Diary: Support Fortnum & Mason Protesters. This entry was posted on Monday, September 26th, 2011 at 02:39 pm and is filed under My Own Work, Photo Issues, Political Issues. You can follow any responses to this entry through the RSS 2.0 feed. You can leave a response, or trackback from your own site.